or VSA Ohio are important and helpful to an artist and their professional work. The event is free but please register beforehand by sending an e-mail to mgreen@vsao.org with “Careers Workshop Registration” in the subject line. Don’t miss this great chance to advance your career in the arts! Rochester Contemporary Arts Center (RoCo) is hosting it’s 7th Annual small art phenomenon, 6x6x2014. Take part in an incredible exhibition of pieces created and donated by celebrities, international and local artists, designers, and students alike. The 6x6x2014 exhibition is a great opportunity for artists to sell works based on composition in a 6×6, 2D or 3D frame, as each piece is anonymous until sold. Those of you that entered a piece into the Ohio Art League’s Thumbbox Exhibition already know the drill! Although there is no entry fee, each work will be for sale at $20 to benefit the Rochester Contemporary Arts Center, and all entries will be accepted and exhibited in the gallery and available globally online! For more information and a list of FAQ’s on RoCo or the 6×6 exhibits, click here! Have you ever been inspired to create a work of art but have no idea where to begin? An expressive, imaginative piece incorporates the inner workings of an artist’s mind and converses to that of the viewer. Learn to represent yourself in all your entirety while still maintaining a fluent dialogue by investing in the Mixed Media Painting workshop this summer at the Columbus Cultural Arts Center. Participants will discover various techniques, such as layering, image transferring, and paint glazing, that will surely assist them in projects on the horizon. Directed by Los Angeles native and conceptual artist Christine Guillot Ryan, this Mixed Media Collage Painting workshop encourages its contributors to experiment with new media, resulting in a variety of finished sizes and formats. This workshop takes place Monday, June 23 – Friday, June 27 from 9 am to 4 pm. Registration for the course is $350, which includes free studio time and a list of materials. 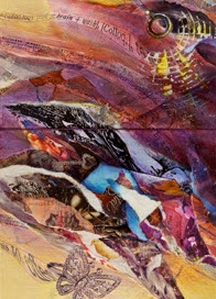 Learn a new trade this summer and register here for the Mixed Media Collage Painting workshop!! The Ohio Art League is looking for visual artists living in the state of Ohio to submit work for their annual Spring Juried Exhibition. If you are not an OAL member don’t worry! All artists member and non-member are eligible to enter (there is a non-member artists entry fee of $35). Only online form entries will be accepted. There will be assistance available at the gallery during drop off to complete the registration form, if needed. The $35 entry fee is waived for all OAL members. Artist, Title, Medium, Size, and Price. Submission of an entry shall constitute agreement on the part of the artist to all conditions set forth in this prospectus. Accepted artists grant permission to OAL to use images of their work for promotional purposes. Price your work with the understanding that OAL assesses a 30% sales commission. OAL reserves the right to refuse to display any accepted work for any reason. At the request of the exhibition location, work must be suitable for all ages. or OAL sponsored show will be considered. Work must be suitably framed and wired or otherwise prepared for installation. All entries must be original works, created in the past 3 years. Works altered from the submitted digital images will not be accepted. All reasonable care will be exercised by OAL and its agents, but OAL and its agents are not liable for loss or damage of work in its care nor during transport. Work must be under 6 ft. in any direction and weigh less than 50 lbs. Glass Axis is holding a free demo with Victoria Ahmadizadeh, as well as their Glassqueraade Fundraiser! Detaials down below, and go to glassaxis.org to get more info. You can also donate to Glass Axis if you cannot attend the event, link included in the description below. 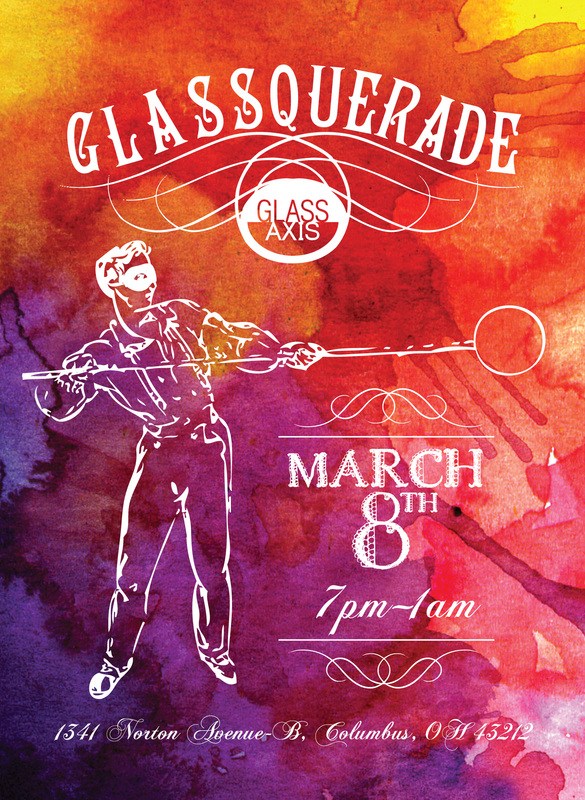 Glass Axis, a vibrant glass art center dedicated to making and learning, would like to invite you join us March 8th for Glassquerade, a Mardi Gras celebration fundraiser. The day will start with all ages glass workshops. At 8 pm our formal fundraiser will begin featuring exciting glassblowing demonstrations and performances, live music and dancing. Ticket prices include appetizers and refreshments. A cash bar will be open all night. The highlight of the evening will be a high energy glass fashion show. Proceeds from the event will be used towards the upcoming move to our new facility in the Franklinton neighborhood. Enjoy an evening of entertainment by your local glass artists while supporting Glass Axis, a unique resource in our community. Tickets will be available for pre-purchase on Eventbrite or at the door. General admission is $20, VIP admission is $50 & will include an impressive swag bag. Come dressed to impress – costumes are encouraged! The event will take place on Saturday, March 8 at Glass Axis. This will be a ticketed, fundraising event. Proceeds from the event will be used in our upcoming move to our new facility in the Franklinton neighborhood. The day will start with glass workshops for adults and children, and in the evening our formal fundraiser will feature glassblowing demonstrations, live music, performances and dancing, as well as food and beverages from our sponsors. The evening will culminate with a glass fashion show. Please share in our celebration of new beginnings! Interested in being a volunteer? Please fill out our online form. If you can’t volunteer or attend, but would like to support Glass Axis, please click here to donate.If you have any questions, please email hello@glassaxis.org with “Glassquerade” as the subject. Every last Saturday of the month Glass Axis presents free demonstrations. Watch as an artist makes their personal best. This in-depth demonstration shows the step-by-step process and finesse of creating glass art. In Februrary, we feature Victoria Ahmadizadeh. Ahmadizadeh will construct a glass interpretation of a “rat king” in the hot shop. A rat king is a cluster of mice whose tails have become intertwined, causing the mice to coexist and grow together for the rest of their lives. The phenomena is regarded as a bad omen, and in medieval times it was believed that a rat king was a single creature with many bodies. Overall, Ahmadizadeh is interested in our relationship with rats – small, intelligent creatures that are loathed as domestic intruders, coveted as pets, used widely for scientific research and referenced in pop culture as both adorable and fearsome. Victoria Ahmadizadeh is a sculptor who creates narratives examining paradox in society and individual identity. She draws inspiration from a myriad of places, such as her Persian and Hispanic family heritage, interest in fashion’s link to culture, and formal training as a painter, glass artist and ceramicist. Ahmadizadeh is from the Philadelphia region and holds a BFA in Glass from Tyler School of Art at Temple University, 2010. She was recently an intern for the John Michael Kohler Art Center’s Arts/Industry residency program, WI, where she assisted residents of the Kohler Co. Pottery. 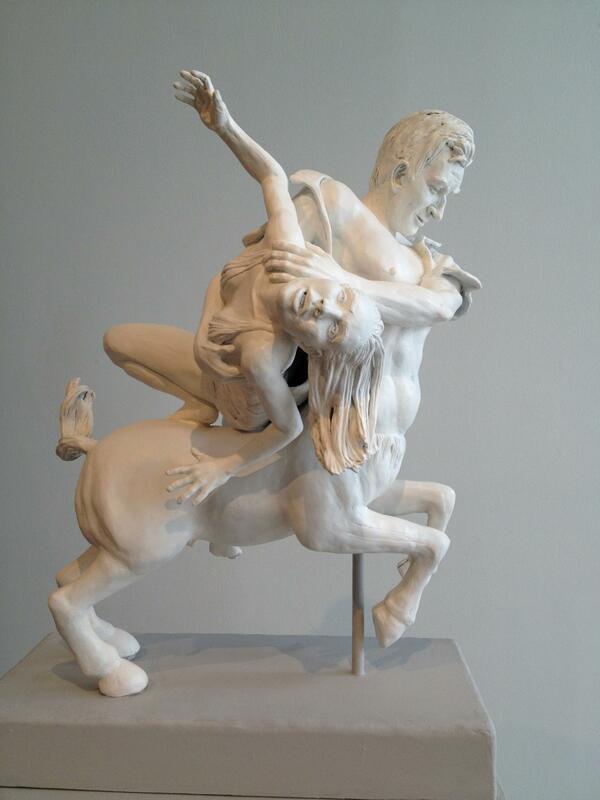 Ahmadizadeh was a member of The Clay Studio’s Work Exchange, PA, from 2010-2012. She has traveled to Penland School of Crafts, NC and The Studio at Corning Museum of Glass, NY to participate as a scholarship student. Ahmadizadeh has also been a summer staff member and artist assistant at Pilchuck Glass School, WA. She currently resides in Columbus, OH where she is a visiting scholar and artist assistant at The Ohio State University. Ahmadizadeh’s work is notably included in issue #33 of The Corning Museum of Glass New Glass Review. We would like to thank all our members for their patience and understanding during this hectic time and would love and appreciate any assistance from our member base. The Short North Arts District is decorating Short North once again with murals by local artists, including OAL members Maria DiFranco, Tom Baillieul, and Winnie Sidharta Ambron. All eleven artists are sponsored by galleries or institutions in Columbus. Be sure to support our members and local artists by checking out these beautiful works! The Short North Alliance and 11 partner galleries and art institutions with the support of the Create Columbus Commission present the second iteration of the highly popular Short North Temporary Mural Series. 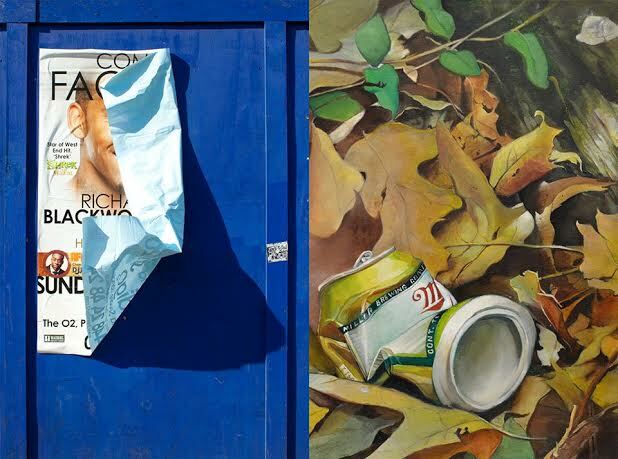 The exhibition, titled Viewpoints: Murals by Young Professional Working Artists, with openings at each participating gallery in the Short North Arts District. All participating artists are either young professional artists under the age of 40 or are young at heart emerging artists who regularly support and mentor artists under 40. The series as a whole showcases works that reflect the individual perspectives or viewpoints of these artists. The murals are installed on the exterior brick facades of 11 buildings along High Street in the Short North Arts District. They are produced in partnership with Orange Barrel Media and consist of high resolution images of art works that are printed on vinyl and heat-adhered to buildings. The process results in a work of art that looks painted on the building. Virtually all 11 artists will be onsite from 5:30 PM-8:00 PM for the February 28 opening at each participating gallery to share their insights on the experiences of young professional working artists in Columbus, Ohio. Create Columbus Commission President Kevin Tyler and City Council Representatives will kick off the opening with remarks at Brandt-Roberts Galleries, located at 642 N High St, Columbus, OH 43215. In support of Viewpoints, the Short North Alliance will host Street Talks, twice-monthly mural tours, which will give insight into the artists’ inspiration for their work, and will give a history of the mural project. 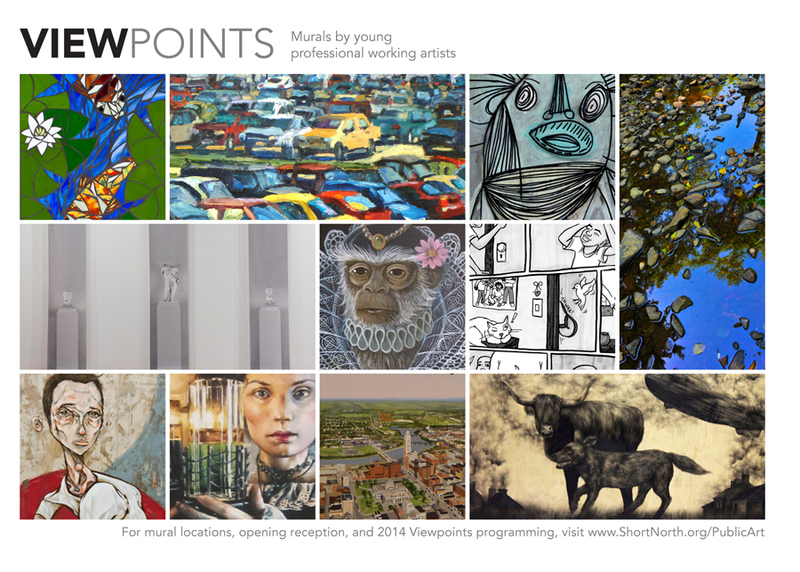 During Gallery Hop throughout the next year, each sponsoring gallery will host a Viewpoints Artist Talk from 4 to 6pm. These talks are open to the public, and will feature topics geared toward young Columbus professionals. Anyone currently residing in the greater Columbus area is encouraged to submit proposals for a City Center Gallery exhibition. The exhibition will be in June of 2014 and the call for entries is currently open. The artists will work with student staff members to ensure excellent representation and installation. Artists who display in the gallery will have the unique opportunity to exhibit work in a professional setting while gaining real-world knowledge of gallery operations. To download the 2014 City Center Exhibitor Guidelines and Information, please click here. 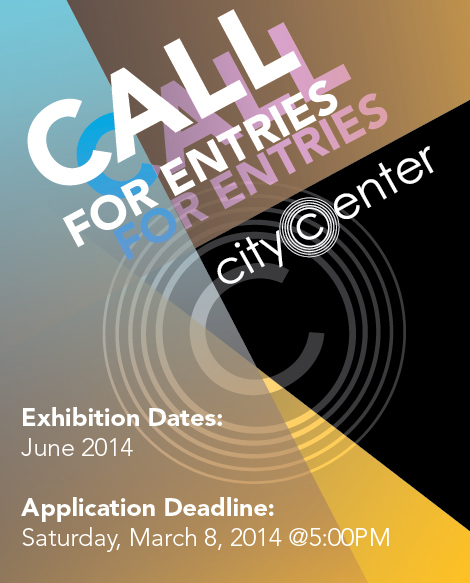 To download the 2014 City Center Gallery Exhibition application, please click here. If you have questions about City Center Gallery or the application process, please call the OSU Urban Arts Space at 614-292-8861 or email: uascitycenter@gmail.com. Majestic Galleries Front Gallery will feature the work of Ohio University Honors Tutorial College student Babz Jewell and Ohio University School of Art + Design student Todd Kunkler. Entitled CODEC, the exhibition will feature paintings and other works by Jewell and Kunkler. The Exhibit runs February 28- March 23! 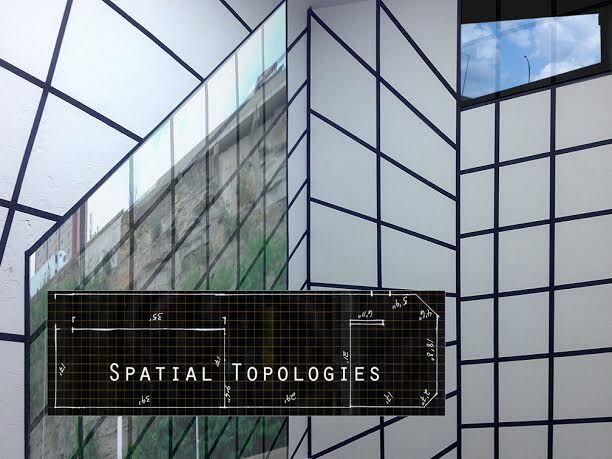 The Majestic Galleries is celebrating the opening of Spatial Topologies, a collaborative exhibition bringing together four multi-disciplinary artists, with a free public exhibition on Friday, February 28th from 6 to 10 p.m. The exhibition features Brian Harnetty, a sound artist from Ohio; Astrid Kaemmerling, a painter and installation artist from North Rhine Westfalia, Germany; Josh Ottum, a musician from California; and Jena Seiler, a video artist from New Mexico. What binds these artists together is a particular interest in collaborative interdisciplinary activity. With emphases on process and site-specific renderings, the artists aim to explore (de)generative characteristics of spatial experience. Viewers are invited to immerse themselves in the artists’ production and exploration of place. These experiments manifest themselves in visual depictions of urban intersections, aural documentation of the Little Cities of Black Diamond, and physical transformations of the gallery space itself.